Price: 1200 MSP – Buy Now!!!! Justice! Justice is what you seek in Deathspank. But how you go about obtaining Deathspank’s own brand of justice is a very unique journey. HotHead Games has developed the latest action RPG to hit the XBLM and it is one of the most unique games you will end up finding on the Marketplace. 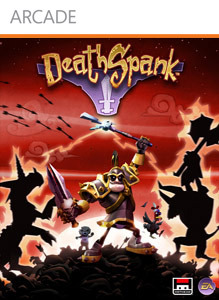 Think of the mass enemy slaying of Diablo, and the amount of various odd items and their uses from the Monkey Island series, and you combine them together to create Diablo Island, I mean Deathspank! Deathspank has only one goal in mind when he starts his adventure, and that is obtaining “The Artifact.” What is this artifact you say? What of the dark forces that are approaching the same Artifact that you seek? You will have to wait and see but as your standard story twist goes, there isn’t much to go off of with the storyline basis. The part where the game truly shines, is the way it expresses the story. Everything in Deathspank is treated with a tongue in cheek manner. Literally everything you do will have some sort of comedic element adapted to the circumstances around you. This isn’t even your standard run of the mill jokes about small characters or about the hero Deathspank, those are there too but there are quite literally thousands of laughs to be had when you play through the story. To further the humor, every time you meet a character to converse with, it opens up a treasure trove of comedic responses made by both the NPCs and Deathspank’s past accomplishments. You may occasionally wonder exactly what they are talking about due to the way it is treated, but you will never be lost as you navigate through the various dialogue choices due to the amount of detail and writing that was put into making everything flow, despite the looniness of it all. All in all, with all the laughs to be had in a full playthrough you can complete the game nearly 100% with about seven hours worth of play time. Which is a huge benefit for a game that is on the Marketplace like this, and for the price that they are asking. There are a plethora of different side quests to do, which expand the game time even further. 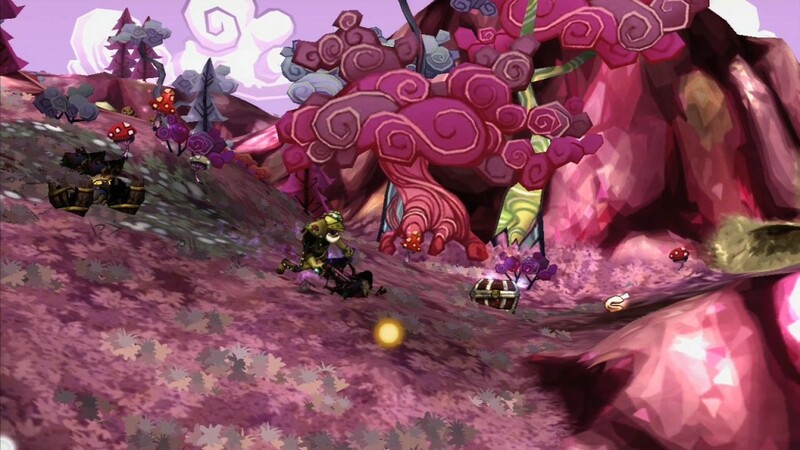 Deathspank presents a lovely little world wrapped up in something that you would see out of Super Paper Mario almost. The character models and some parts of the environment contain 3D objects but for the most part, various things will be seen in 2D. Rather than seeming out of place however, with the cartoonish graphics being as they are you will find this mixture of the two very intriguing and perfectly matching in the games world. The world itself is extremely varied, and colorful to boot. Every area you traverse as DeathSpank will have a unique feel to it. Though there is a bit of a problem when a large amount of action is occurring on the screen at once, the frame rate does begin to suffer. This is especially noticeable during Justice Meter attacks. As you enter the world of DeathSpank you will be thrown right into a small battle after the opening narrative. The way combat works is very simple to control, if not a bit repetitive. There are four different weapon slots that you can equip at one time, and each one is mapped to the face buttons; A, B, X, and Y. D-pad is able to take care of the health care items and various spell orbs. 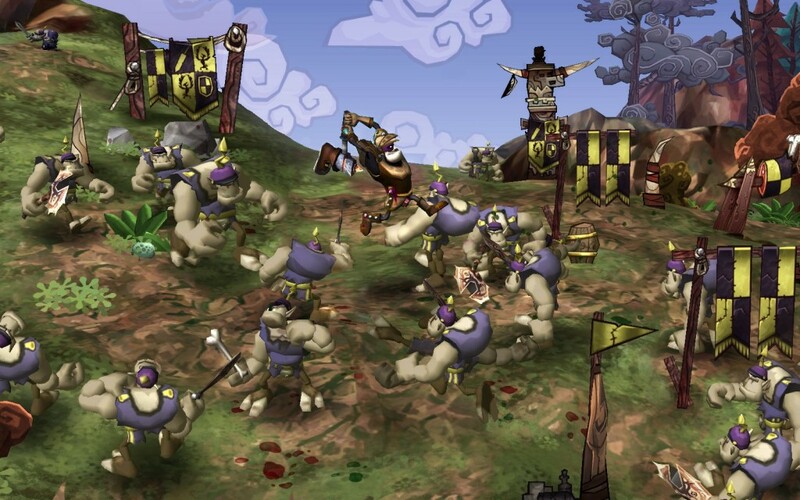 In a large way the combat takes up the entirety of the game, whether you are shooting at one simple enemy, or beating away waves of enemies with a boot attatched to a hammer. The combat does eventually begin to fall into a very dull category simply because many enemies are beatable simply through button mashing. Orb spells and help from heaven do add in some variety but they are better seen as small alternatives compared to simply beating those vicious chickens to death. The “Justice Meter” is an interesting special move which will change depending which weapon you have to use it with, but not all weapons will contain this special ability. This meter is filled through the beating of enemies which means that you will often be performing a special attack when you are slaughtering your foes in the name of Justice. And slaughtering your enemies will drop loot, so much loot you could probably fill a landfill with all of the things you will be obtaining. There is a plethora of gears and weapon that you will obtian in your search for Justice and The Artifact. So much so that they included a feature that will automatically equip any armor that is stronger than your own that you so happen to pick up. Believe me when I say that this option is a godsend due to the fact that you will be picking up so many items that sorting through the inventory screen to find out what was best, would take a long period of time and often turn out useless and meant for the grinder. Small feature there that was a nice touch, is that any and all items that aren’t quest related can be turned into immediate gold by depositing them in the Item Grinder, patent pending. Another nice feature is that DeathSpank’s armor will change depending on what piece of armor your wearing, down to the shoulder pads and boots which is a nice touch, especially for an arcade game. 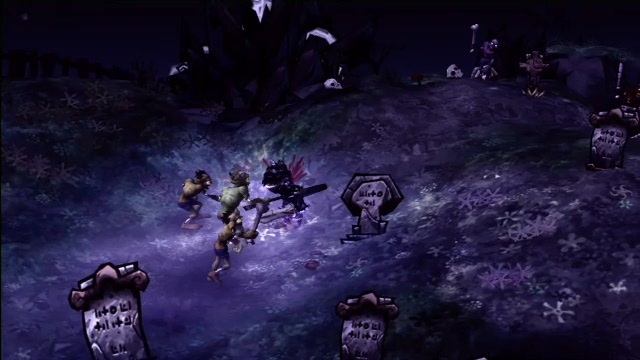 Now amidst all this destruction, DeathSpank will end up dying, quite a lot in some cases, especially if you stumble into an area where monsters are much higher leveled than you are, which is a bit of an annoying feature but one easily avoided as level grinding is usually not a necessity. But when you do die, you will respawn in an outhouse. Yes an outhouse. These act as checkpoints or even teleporters which cut down the time necessary for traveling greatly, and a very unique take on respawning. So, you live and die and kill many many foes in the name of Justice, but what is Justice to DeathSpank? Well for the most part it boils down to various quests. Though in the end these quests primarily involve either A. Kill so many things, or B. Kill so many things to get a certain item, or C. Get this item from the environment. Which means they are nearly always a large amount of fetch quests that don’t create much variety. The true variety of these quests turns out to be why you are doing them in the first place, and the NPCs that give them to you, some even have small twists involved. Plus as a small side note, if you ever become stuck in a quest for whatever reason, you can use something called a Fortune Cookie to find a certain hint for the quest. These are found throughout the areas and should be using sparingly due to the nice touch that they add to some of the more complicated quests. You also have the option to play with a friend in local co-op. Unfortunately you do not have the option to take your Deathspanking online due to the fact that there is no Live supported multiplayer. Your friend will play as a wizard with strong magic spells and healing spells, but unfortunately will not level up and have practically zero customization due to the fact that your co-op partner even shares the same health bar as you do. If you really like to laugh and have a good time, then DeathSpank is right up your alley. Especially if you like hack and slash RPGs with a decent storyline and enemies to destroy. Though the combat does eventually fall down to becoming repetitive, and the amount of items you obtain becomes overwhelming at times this would be a very hard game to pass up on the marketplace for only 1200 MSP.